We're back to light and fun things today. I feel like I have really been neglecting my dress wardrobe with this dreadful winter weather but spring is just around the corner and I couldn't be happier! You may remember my post on vintage belts from a few weeks ago. I ordered 4 beautiful belts from Hannah Jane Boutique and have been wearing them with some of my spring time dresses on our recent warm days. I love a simple belt with bold color that you can mix and match with several pieces. My only complaint was that I didn't order more colors when I had the chance! In case you missed the sale or, like me, wish you would have picked just one or two more basics, Hannah Jane Boutique has brought the $5.99 belt sale back just for us now through Saturday! Stay tuned tomorrow for another spring look featuring one of my fab new Hannah Jane skinny belts. Va-Voom Vintage is an affiliate of Hannah Jane Boutique. Please see my full disclosure policy. Whoa! 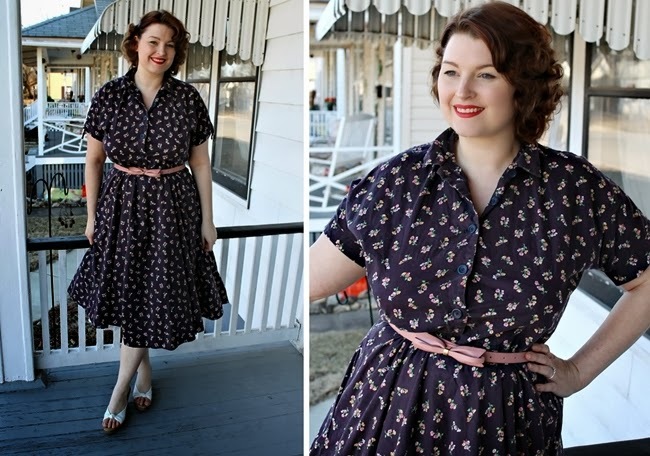 Maybe my favorite outfit post to date with your dress, shoes, makeup, hair, everything! Love it, you look as sweet as an apple pie. 5.99, what a splurge haha! Thank you!! Its one of my faves! I bought it from my favorite vintage shop in a small town here in MO on my birthday a few years ago. I love the cut and the cotton is so comfy, I wish I had 5 more exactly like it! Such a pretty, wonderfully classic outfit! I adore skinny belts, too. For petite (height) gals like me, they're a marvelous way to help enhance one's curves without appearing to cover one's natural waist entirely (as wider belts sometimes can). What a fantastic ensemble, and those skinny belts are just adorable. I love the big bow and petal pink color of the one you're wearing! It goes with that (fantastic) dress so well. I have a very similar pair of shoes I also thrifted. its perfect! i feel the same way, the heard winter is coming to an end and i;m ready to get back out into the sunshine in fun vintage dresses. I have this thing where i basically have to wear a belt with every dress, so this is right up my alley. Thanks for sharing, you look marvelous!